I started this morning off with a beautiful 4.5 mile run. It was cooler than I'm used to running in...it's June so it wasn't freezing, I know I'm slightly a baby when it comes to running in the cold...or just cold in general (I hate the cold!) So I pulled out my old running tights, which people leggings today, and I layered my shirts. But by the time I was half way done I had to take one layer off. The only thing that it really bothered were my ears. I need to get headbands that cover your ears. Starting your morning off with a run tends to make you think a little healthier the rest of the day. So instead of cereal or toast, I had eggs for breakfast. 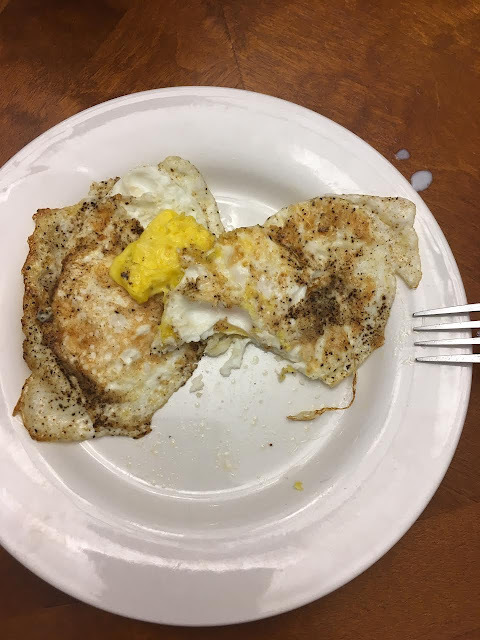 Recently fried eggs have been a big favorite for me for breakfast. 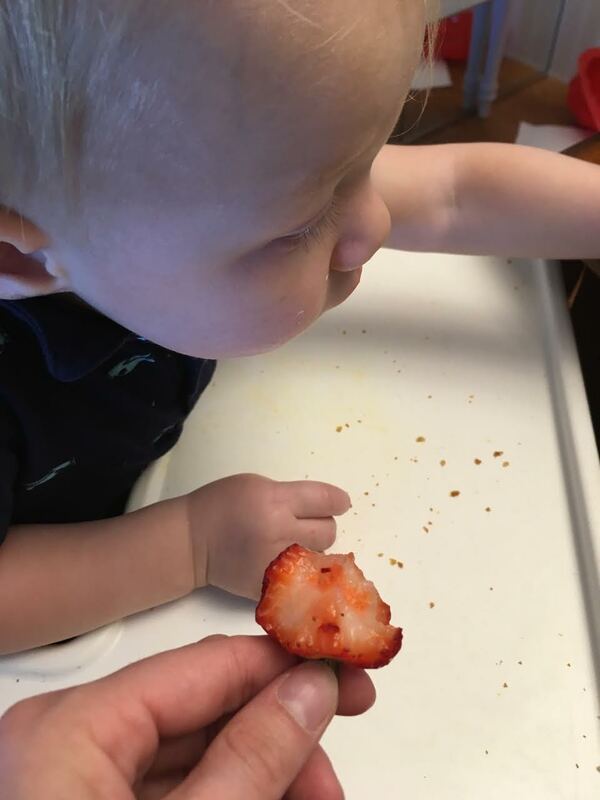 V hates fruit most of the time. I usually cut it up in pieces and let him feed himself, but I think I found the way to get him to eat it. He eats it way better if he's eating it whole. I don't know why this is what works. I don't see a big difference, but he does and that's what matters. For Mothers day, my mom gave me some socks made out of bamboo. They are my favorite socks I think I've ever had. They are so soft and they help your feet not sweat so much. 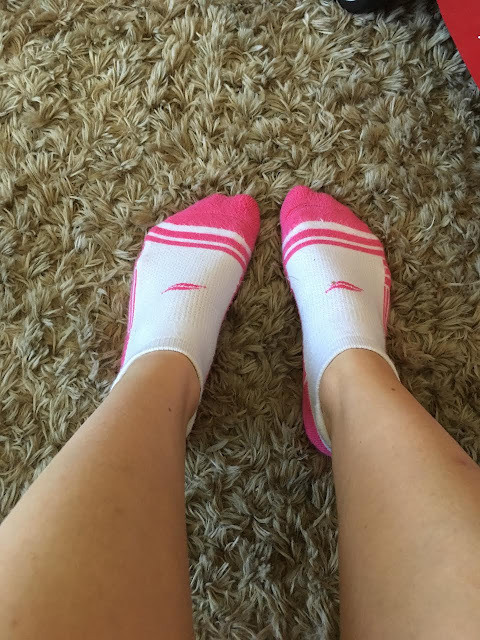 If you're looking for some good socks, I highly recommend these. You can get them HERE. 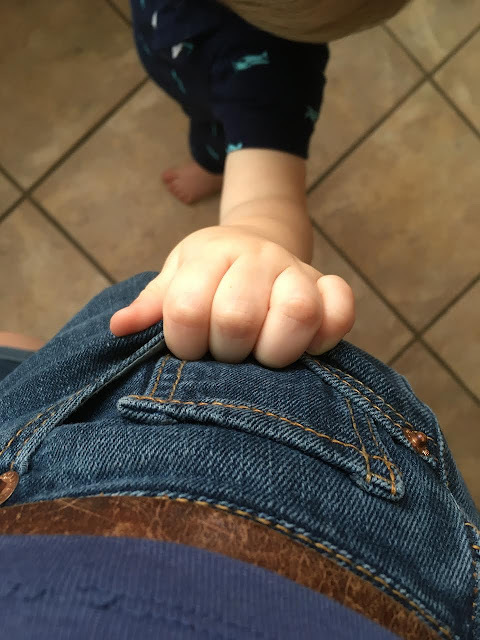 I love when he holds my pocket. Little man has been a little clingy today. But he's sweet and I love him! 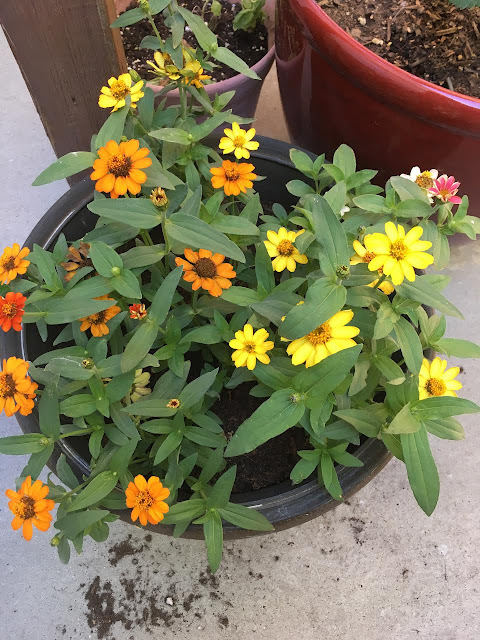 One of the few of my plants that are surviving this year. Actually, my plants have done a lot better since I found out about the caterpillars and sprayed for them. Go figure. Somehow the girls found out about Emperors New Groove. Somehow, we also didn't have it. Which is weird because it is one of my favorite Disney movies. They have been dying to watch it because I keep quoting it now. Today my sister brought it over and the girls are laughing their heads off at it. I love that. If you haven't seen it, I really must insist that you do. So several months ago, while I was taking my blogging break, we had dinner at a friend's house. They had girl scout cookies. I was a girl scout cookie virgin. I'm pretty sure I went my whole life until that night not having any. So I tried whatever the cookie is with the coconut on it. 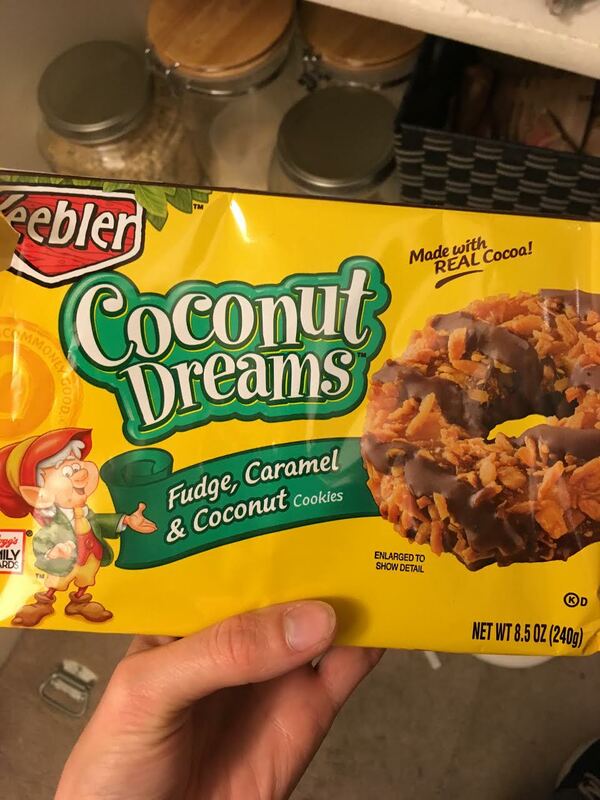 I don't like coconut, never have, but I loved these. I ate the whole box I'm pretty sure. So I'm pretty cheap, I don't like to spend full price much. I keep hoping someday this will change a little and I'll feel ok about a splurge but it hasn't. I saw these coconut dream cookies in the cookie aisle and had to try them. They aren't exactly the same, but they are pretty close I think. A lot of times when people hear that I'm a runner, one of the questions that follow is "So do you run marathons?" No, I've never done a full marathon. I've gotten close, but I haven't done it. It's not because I don't think they are hard...or that they would be too hard for me, or anything like that. It definitely would be a big challenge. But there are a few reasons that I've been sticking to the 5k lately. The 5k is a good distance for me to race in right now because it's a distance that I know that my body can handle without getting injured. And I'm prone to injury. In high school, I was injured at least once a year, mostly because I wasn't listening to my body (or my coach). So now I listen to my body better and I take care of myself a little better too. A marathon would be a huge step for me. Even a half marathon, and someday I would like to do one. But the 5k is great because I can see my improvements in that race, whereas the other races I'd be starting from square one. In the last 4 years, I've run a couple of races a year (Last year I missed race season because I had a baby) and I've PRed at almost every race I've run. For most of us, that PR drives us more. Just like with anything, you can get burned out real fast if you do too much at once. I've always wondered how marathon runners keep from burning out halfway through their training. It takes so much time (and energy) to train in general, and at this point in my life, with my little ones that need to be taken care of, I don't have all that time to run every day. I'd love that someday, but not today.